The town is located 12 kilometres (7.5 mi) north of the capital city of St. John's and is part of the St. John's metropolitan area. Due to the Torbay's close proximity to St. John's, the town's population is quickly growing. According to the 2016 census the population was 7,899, up from 7,397 in 2011. The name Torbay comes from Torbay, Devon, England and was first mapped in 1615 by John Mason. It comes from the old Anglo-Saxon "Tor" which means "a rocky hill". Both places are geographically similar with wide-open bays that face in a northeasterly direction. An extract from Bishop Feild's Journal states, "indeed there seems to be a little colony of Devon folk in Torbay." John Nutt, the pirate, settled here with his family from Devon. The community of Torbay experienced three French campaigns, the first of which occurred in December 1696. These invasions contributed to the eventual construction of the Torbay Battery in 1781, which was manned by 25 troops from the 71st Regiment and Royal Artillery. The ordnance was eventually withdrawn in 1795. The census of 1677 indicated the Cole and Corum families as residing in "Tarr-Bay" Newfoundland. The following year the Field Family joined them. By 1794 the population of Torbay included many of the surnames now associated with Torbay and totalled 108 English settlers and 99 Irish settlers. The Way Office, a mail handling facility used where there was not enough business to warrant a full post office, was established in 1891. The early history of the community was further highlighted by the landing of Colonel William Amherst and his troops in 1762 on their way to re-capturing the capital city of St. John's from the French. This event was officially recognized in 1978 when the first mayor of Torbay, William Manning unveiled a stone monument and plaque at the present day Veterans Memorial Park. In the 2016 census the population was 7,899. In 2011 Torbay's population grew 17.8% from 2006 bringing the population to 7,397, making it one of the fastest growing communities in Newfoundland and Labrador. The town of Torbay is a bedroom community, with most of the workforce commuting to the nearby cities of St. John's and Mount Pearl. No public transport links St. John's to its northern suburbs and exurbs, and all such commutes are done by car only. The town's economy is driven mostly by service industries that serve the residents such as a grocery store, convenience stores, doctors offices, hair salons, real-estate offices and restaurants among others. With population growth in the town in recent years the housing market has become a significant part of the local economy. Torbay has become the most expensive housing market in the province with average home prices surpassing $375,000. Between 2009 and 2010 the town also saw the largest appreciation in housing prices in the St. John's CMA, with housing prices rising 32%. The town is serviced by St. John's International Airport which was formally the Torbay Airport. Airlines include Air Canada, Air Canada Express, Air Labrador, Air Saint-Pierre, Air Transat, Porter Airlines, Provincial Airlines, Sunwing Airlines, WestJet and WestJet Encore. The airport offers services across Canada and the United Kingdom and Ireland, to the United States, Saint-Pierre and the Caribbean. The town council of Torbay is composed of a mayor, deputy mayor and five town councillors. The mayor and councillors are elected during the municipal election, which is held every four years on the last Tuesday in September. The deputy mayor is subsequently elected by the town councillors and the mayor, during the first meeting of the new council. 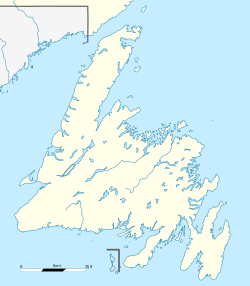 Torbay is a part of the provincial electoral district of Cape St. Francis, the district is a tory stronghold and is currently represented by Progressive Conservative MHA Kevin Parsons. The town is represented in the House of Commons by the federal riding of St. John's East, formally St. John's North. The seat was another tory stronghold and was represented by Conservatives MP's for the majority of time since 1949. Since 2015, Nick Whalen has been MP for the area. The town is home to the Northeast Eagles, which offers novice, atom, peewee and bantam hockey for youths. The town also has a senior hockey team for adults, both teams play at the Jack Byrne Arena. The arena is Torbay's first hockey arena which opened in October 2008, under the name North East Avalon Arena. In March 2009 the arena was officially opened by Premier Danny Williams and was renamed the Jack Byrne Arena after the former MHA who had died in early 2008. The Torbay soccer association runs soccer games throughout the summer for youths. The town is home to Holy Trinity Elementary which offers kindergarten to grade 4 education, Juniper Ridge Intermediate which offers grades 5 to 7 and Holy Trinity High which offers education from grades 8 to 12. English and French immersion education is offered at both schools. A new elementary school was constructed to replace the former Holy Trinity Elementary; the school opened in September 2010. The School is still called Holy Trinity Elementary School. Juniper Ridge Intermediate was opened in September of 2018 with attending students from the surrounding area. ^ a b c d "Torbay, T [Census subdivision], Newfoundland and Labrador and Canada [Country] (table). Census Profile 2016 Census". Statistics Canada. February 2, 2017. Retrieved February 21, 2018. ^ a b "Census Profile - Torbay". Statistics Canada. Retrieved 2 March 2012. ^ Mills, A. D. (1996). "Torbay; Torre". The Popular Dictionary of English Place-Names. Parragon Book Service Ltd and Magpie Books. p. 332. ISBN 0-7525-1851-8. ^ "Population and dwelling counts, for Canada, provinces and territories, and census subdivisions (municipalities), 2011 and 2006 censuses". Statistics Canada. Retrieved 2 March 2012. ^ "Canadian Climate Normals 1971-2000". Environment Canada. Retrieved 2010-04-20. ^ "Calculation of the 1971 to 2000 Climate Normals for Canada". Environment Canada. Archived from the original on 2013-06-27. Retrieved 2010-04-20. 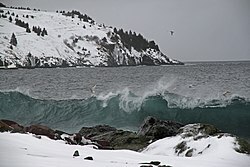 Wikimedia Commons has media related to Torbay, Newfoundland and Labrador. Torbay - Encyclopedia of Newfoundland and Labrador, vol.5, p. 398-400.